Heat oven to 400°F. Beat egg in large bowl. Add ground beef, bread crumbs, onion, bell pepper, salt, celery salt, 1/8 teaspoon ground red pepper and 2 tablespoons of the tomato sauce; mix well. Shape mixture into 48 (1 1/4-inch) meatballs, using about 1 tablespoon mixture for each. Place in ungreased 15x10x1-inch baking pan. Bake at 400°F. for 15 to 20 minutes or until thoroughly cooked and no longer pink in center. Meanwhile, heat oil in medium saucepan over medium-high heat until hot. With wire whisk, stir in flour; cook and stir until mixture turns a deep, rich brown color. Stir in remaining tomato sauce and all remaining sauce ingredients. Bring to a boil. Cook an additional minute, stirring constantly. Add cooked meatballs to sauce; stir gently to coat. Serve with cocktail toothpicks. Cajun cooking combines French and Southern flavors and cooking methods. Creole cooking, an African-Spanish-French medley, calls for more tomatoes, butter and cream, but less spices than Cajun cooking. 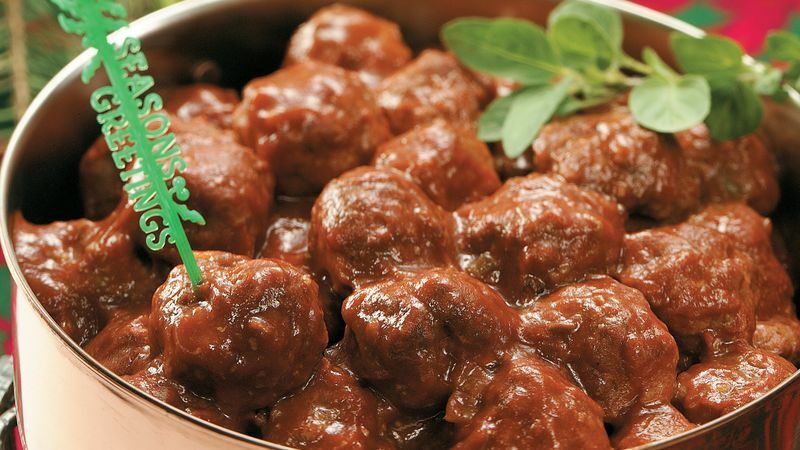 Prepare the recipe, transfer the meatballs and sauces to a baking dish and cool. Cover and refrigerate for up to a day. To serve, heat it in a 350°F. oven or transfer it to a saucepan and heat it gently over low until it is hot. Either method takes about 10 minutes.